What happens when you let loose one of Australia’s best known and beloved satirists on the fairy tale stories you grew up with as a child? If your answer is a book like Tales From A Tall Forest, then you are right on the money! 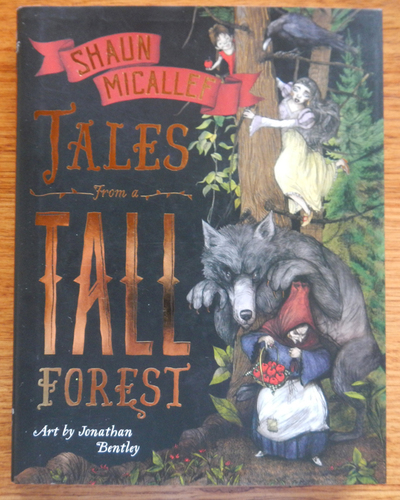 Comedian, writer, actor, producer, author and former child (his words) Shaun Micallef has recently released his first children’s book, which ticks all the right boxes when redefining the way that we see fairy tales. He has put his own spin on each story (of which there are three), transforming our perceptions of particular characters and reinforcing others. Set in the largest forest in all of Europe and governed over by the occupants of a splendid castle called Tancred, Micallef mashes up familiar stories like Snow White, Jack and The Beanstalk, Hansel and Gretel, and Little Red Riding Hood, as well as adding in characters from various other fairy tales and nursery rhymes. He manages to weave their stories together, creating surprising new adventures for the characters while still maintaining the old and familiar. Writing with his familiar wit and observations, it’s easy to imagine his voice reading the words as you turn each page. Award-winning artist Jonathan Bentley has managed to bring the subversively silly stories to life on each page, by creating detailed black and white illustrations (with splashes of red) that highlight the absurdity of the storylines. These distinctive drawings, coupled with the extensive text, help to create something that hovers somewhere between a novel and a picture story book. If you’re looking for a fairy tale book that is ‘more grim than Grimms’, less soppy than Aesop’, then this is probably your ideal option.